Here are 7 best free software to extract pages from PDF. While there are numerous PDF splitters available (check this list) that can help you extract pages in a set (say 1-10 pages or 10-20 pages), these software work in a different manner. These software let you select custom page range (like 1-3, 5-7, 9, 10-15, etc.) and extract that page range as PDF files. Some of these software give you the choice to extract page range as separate PDFs or a single PDF. These PDF page extractor software have many other features that you will like. For example, you can merge PDF files, extract audio and video from PDF file, add watermark to PDF files, set password protection, and more. So let’s begin with the first software to extract pages from PDF. You can set custom and different page range for input PDF files and get separate output PDF files based on that range. You can generate a single output PDF that will contain all the input PDF files with custom page range set by you. Apart from the ability to extract pages from multiple PDF files at once, this software gives some more options or output settings. For example, you can set page layout (A4, A5, Legal, Ledger, etc. ), add two pages side by side to make them a single page (2IN1), add only one page (1IN1), or add four pages in a single page in output PDF, and set vertical or horizontal alignment. Option to set master password for opening the PDF files and adding editing, copying, and printing protection is also provided by this software. So, this would be a very good option when you have to save time and extract pages from multiple PDF files in one go. You may also check its detailed review here. 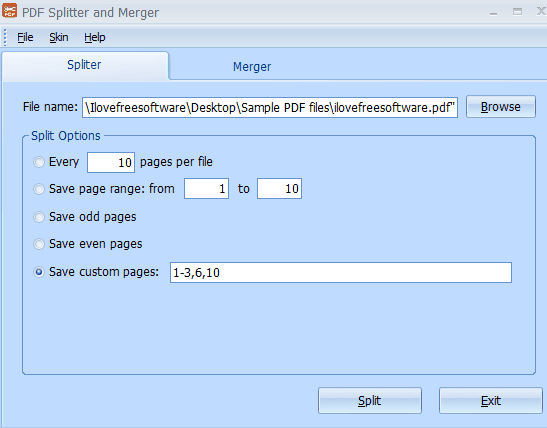 PDF Splitter and Merger is one of my favorite software when it comes to extract pages from PDF. The reason is that it comes with a user-friendly interface and lets you set page range of your choice (like 1-5, 7-9, 12, 14, etc.) to extract PDF pages. Apart from extracting PDF pages with custom range, there are four more options for extraction. You can extract every 5, 10, or 20 pages from PDF, select a specific page range (1-10 or 1-15, etc. ), extract all odd pages, or extract all even pages. Just select a PDF file, select any of these options, and you can extract pages from PDF. 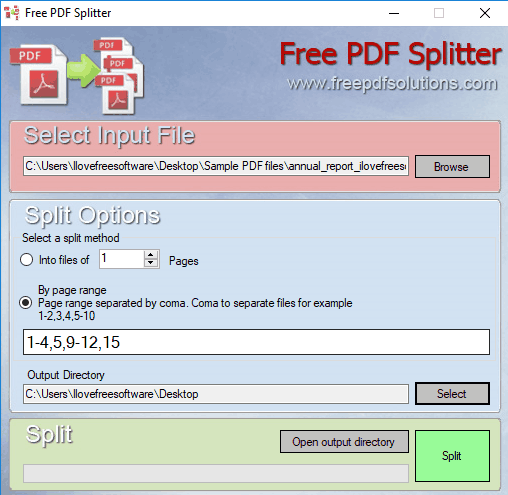 Free PDF Splitter is also a handy software to extract pages from PDF files. It has an advanced feature over PDF Splitter and Merger software (listed above). 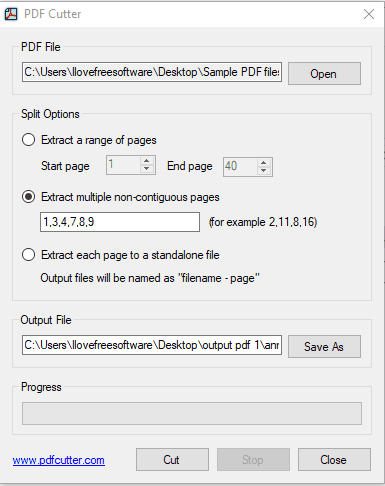 You can use this software to generate separate PDF files of custom page range set by you. While PDF Splitter and Merger generates a single PDF file of selected page range, this software creates separate PDF files of selected page range. This might be the reason you want to use this Free PDF Splitter rather than PDF Merger and Splitter. On its interface, you can add a PDF file, set custom range (1-4, 7, 10-13, etc. ), output folder, and use Split option. After that, you will get PDF files as output. Note: There is also an option available to extract PDF pages by a specific range. For example, if a PDF has 100 pages, then you can add ’10’ as value to generate output PDF files after every 10 pages. Although the option is good but this didn’t work for me. It failed to create PDFs using this option. Like above two software, PDF Split or Merge also lets you select custom page range to extract pages from PDF. But this PDF page extractor software has one unique feature that is not present in any other software covered in this list. You can use it to extract PDF pages by bookmarks. So if your PDF contains bookmarks, then you can select bookmarks and the output PDF files are generated based on the bookmarks range set by you. You will also be able to see how many pages a PDF file will contain after selecting custom range manually or by custom bookmarks range. For extracting PDF pages by bookmarks range, you need to select “Advanced ranges selection” option on its interface and then choose “Split by bookmarks” option. After that, you can see available bookmarks in your PDF file and select those bookmarks as per your wish. This software has a good interface and extracting pages from PDF is simple. 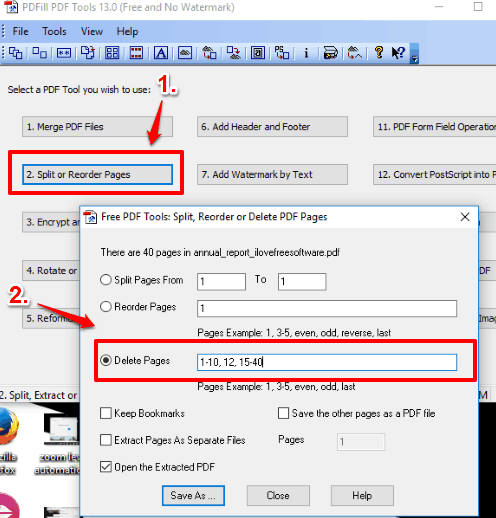 Select Split option (it can merge PDF files also), specify page range, or use Advanced range selection option for bookmarks range, set output folder, and start the splitting process. You will get output PDF files quickly. Note: This software requires Java to install and run successfully. So you must have Java installed on your PC. PDF Cutter is a simple software but comes with three different options to extract pages from PDF files. You can set a range (1-10 or 1-20, etc. ), extract each page as separate PDF file, or extract pages of your choice (like 1, 3, 5, 7, 8, 9, etc.). It doesn’t let you set custom range, like 1-3, 5, 10-13, etc., but I guess the option to extract pages of your choice is sufficient to extract desired pages and create a separate PDF file of those pages. You can add only one PDF file at a time and use any of the available options for extraction. A single PDF is generated for all the pages that you selected for extraction. This software has a basic interface and using it is very easy. PDFill PDF Tools is a whole PDF suite that includes PDF splitter, merger, watermark, rotator, and other features. You need to use its splitter feature to extract pages from PDF files. This software works in a bit different manner than other PDF page extractors covered in this list. You need to add custom page range and those pages are excluded from output PDF file. So set those pages in the page range that you don’t want to include in the output file. When its interface is opened, use “Split or Reorder Pages” button and then you can add your input PDF file. When you have done this, a separate window will open. Use that window to set custom page range. You can also enable options to keep bookmarks (if any) and extract pages as separate files. If you want to generate a single PDF file, then no need to enable separate files option. Set these options and use Save As button to get the output. If you are not interested in trying some third-party software, then you can use the native “Microsoft Print To PDF” feature to extract pages from PDF. Do note that this feature is only available in Windows 10. If you are using Windows 7, 8.1, etc., then you will need to use other PDF printer software. To use this feature, open your PDF file in a browser (like Chrome) or some PDF reader software, and then use Print option. 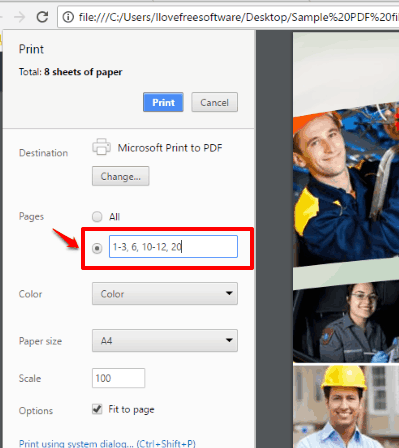 When Print window is opened, select Microsoft Print to PDF as your printer. After that, select custom page range under Pages option, set output location, and click Print option. Instead of actually printing your PDF file, it will extract only selected page range and save all those pages as a single PDF file. Before selecting Print command, you can also set some options related to output PDF. For example, you can set scale percentage, paper size, color or black n white output, etc. This is a very simple way to extract pages from PDF. Here I wrap up the list of my best free software to extract pages from PDF files. All are good and work very well. For me, the most useful and #1 PDF page extractor is PDFMate Free PDF Merger. This is the only software that lets you process multiple PDF files in one go for extracting pages from those PDF files. No doubt that other software are also fantastic but only one PDF file is supported by those software. So if you have a lot of PDF files from which you need to extract pages, then first software should be the first choice. If you have a few files and OK to process them one by one, then all the other software are handy.